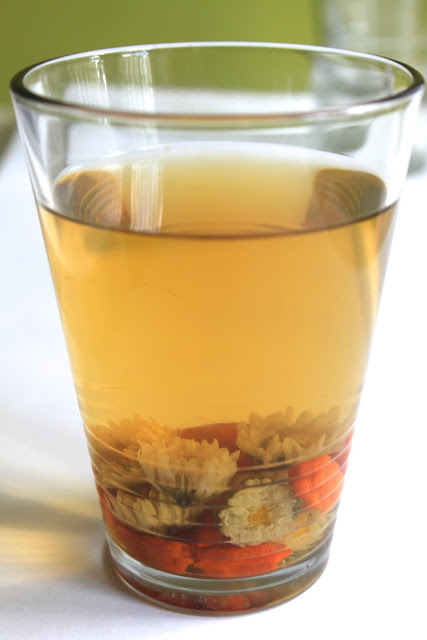 Chrysanthemum tea is one of my favorite drinks from childhood. My mom used to make a huge pot of it with a little rock sugar and I always thought it was such a treat. She would say that drinking the tea was good for us and would make us beautiful when we grew up as a way to get my sister and me to drink more liquids. But, my mom soon learned that statements like that did not get us to do anything. (Also, it wasn't true. It's just something the adults in my family like to say to kids to get them to eat. My mom also liked to say eating fish would make us smart, eating noodles would make us tall, and eating soy sauce would make us dark. I bet lots of Chinese kids heard that last one from their mothers. However, I never needed any convincing to drink chrysanthemum tea because I LOVE(D) the stuff. The scent alone makes me swoon. If I could bathe in it, I would. And, I WOULD boil myself a bath's worth of tea if I didn't think it was a waste. 'Cause I'd rather drink it! 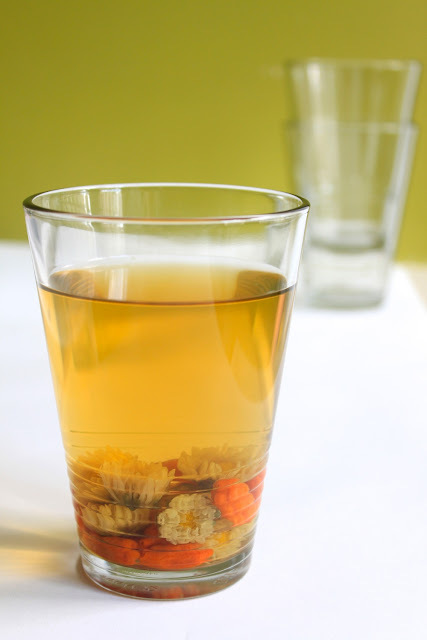 Chrysanthemum tea is really easy to make at home but I didn't realize it until recently, when my mom started to brew it with goji berries instead of rock sugar. The goji berries give the tea a deeper hue while the chrysanthemum + rock sugar combination yields a pretty light yellow color. Traditionally, chrysanthemums are used to reduce your fire energy. 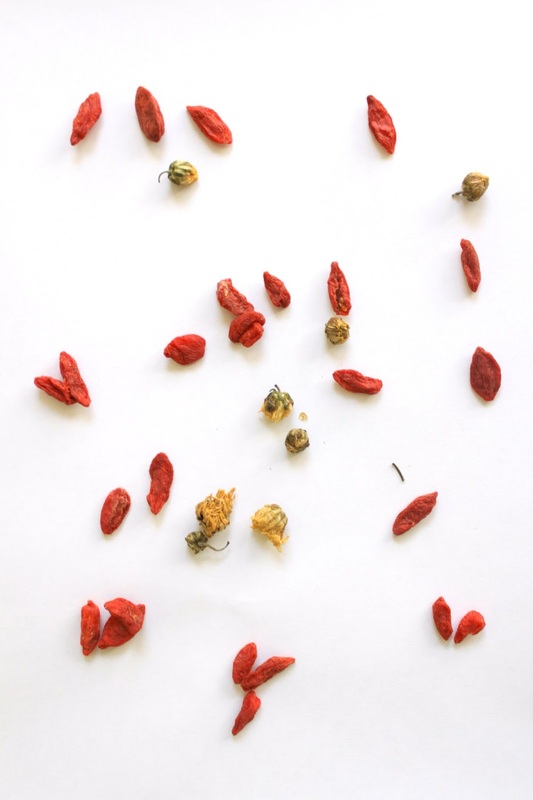 And, goji berries, or wolfberries as they are sometimes called, are purportedly good for eye health. Since my mama was trying to improve her eyesight, she decided to swap out rock sugar for goji berries. 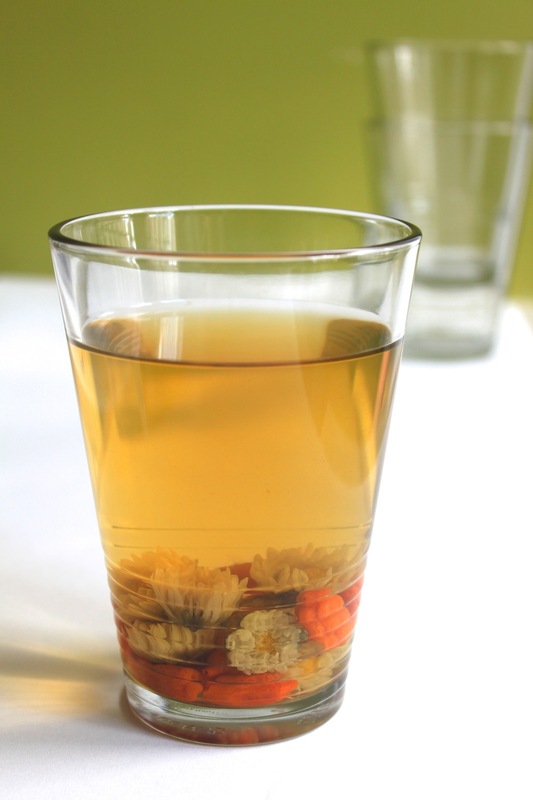 The goji berries give the chrysanthemum tea a natural sweetness. I also love chrysanthemum tea because it's beautiful to look at. AND, it's good for you. Here's how you make it! Lightly rinse the chrysanthemum and goji berries. Bring 2 cups of water to a boil in a small pot. Add in chrysanthemum and goji berries, let boil for 1 minute, then remove from heat. Let steep for a couple of hours until liquid is amber colored. You can eat the goji berries but not the chrysanthemum buds. The tea can be refrigerated for a couple of days but honestly, it's never lasted that long in my house because I drink it like water. Can be steeped for a second time but the tea will be vastly milder. You may need to boil for a minute longer before removing from heat. Toss after second steeping. 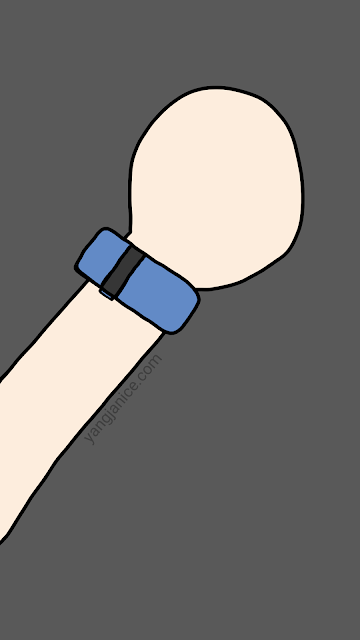 Who else is like Pavlov's dog?